This article will guide you on how to take notes in class. These are my personal student notes from one of the first classes I attended online with Alhuda Institute Canada. The notes give suggestions for the best and most effective way for alhuda students to write within their blue Juz. Draw a circle around the translated word with a pen or pencil. If there are multiple translations, mark the one that has been said. Lots of new words will come up as you progress through each lesson. There are some words when you read them you will memories right away. Some words will be easy and some words will be more difficult. 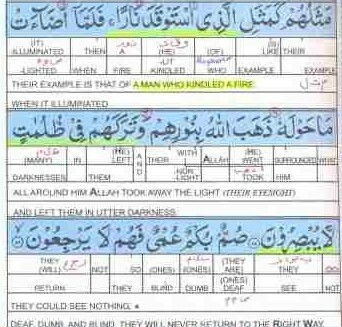 When memorizing a lesson these highlighted words will stick out more, they will catch your eye more and you will be able to memorize them better. All explanation notes should be written on the blank page that is provided in the Juz. It is highly recommended that you do not use a separate notebook. Should you decide to use a separate notebook you will not be able to follow along with the Quran which is already in the Juz. Also, when you are reviewing your notes you will not see the arabic in front of you, making it more difficult to make a connection with your notes and the arabic. By the end of the course, you will have a set of notes contained within the 30 Juz, and not a set of 30 Juz and 30 notebooks which is unnecessary. Upon reviewing your lesson the translation page will have only the root letters noted, you will be able to find the root letters at a glance. Do not write any other notes on the translation page. Many times when we write on a blank page the lines are not straight and space is wasted. You will also be able to fit more notes on one page. 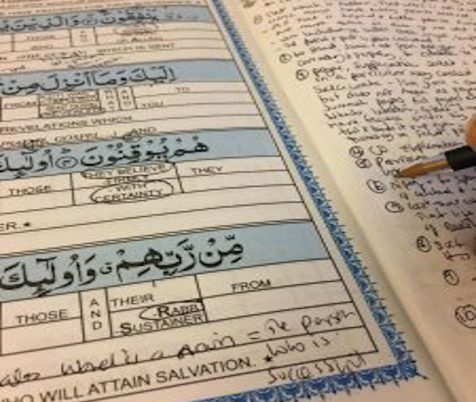 Example, if the word being explained is on the first line of the arabic page, don't write the meaning all the way at the bottom, the closer it is written to each other the easier it will be for you to review and check your notes. They are very important, they are not just random letters. After studying the root letters in detail your vocabulary of the Quran will increase and you will find the benefit of writing the root letters and of knowing the root letters. Example, whether it is a verb, a noun, a description, or adjective when you write the type of word it will be easier to understand. When you understand the word, memorizing and translation will also become easy. When you don't understand the word memorization will be very difficult. 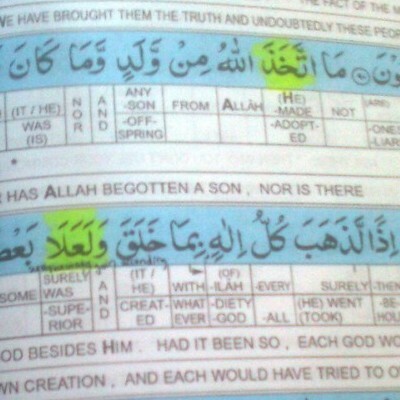 Example رَبَّ rabb, it is from rabba yaribbu, rabbatul bait, you should write all these explanations as well. Write the transliteration only if you are slow or find it difficult to write in Arabic. Later, when you improve you can write the arabic. Find another student in your study group who writes the arabic words, then you can copy and write the words down from their notes. Example حمد hamd, it is to mention the most perfect qualities of someone who is praiseworthy. This will increase your understanding of the words. If your understanding is better then memorizing will become easy, particularly the root letters, the singular plural and also the definitions. The more listening and reading you do, the more the learning process will become easier, the more familiar you will become with the Quran. Find a time that is best for you, if you can't spend an hour find a half hour in the morning or afternoon and half hour before bed, but make sure you dedicate at least an hour minimum. With other responsibilities at home, it can become difficult at times to study and find the time to study. Make dua, pray to Allah and Insha Allah, he will enable you and reward you for the effort that you have put in. Continue to strive In the way of Allah and he will help you. In hadith, it is mentioned that if you take one step towards Allah, he will take ten steps towards you, but you have to start, you have to put in the effort. I hope all the above steps will facilitate your understanding of the Quran. However, you decide to take your notes make sure they are usable in the future. When you don’t take your notes properly it will become very difficult for you to use your notes later on. How do you record your notes? Should you have a different method of taking your notes within your blue Juz which works for you and you feel it may help other students please share. 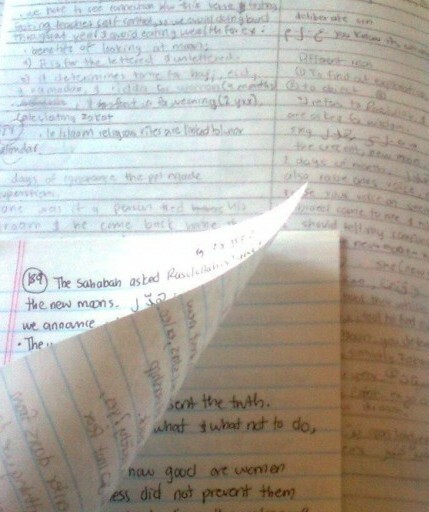 I always experimented with different methods of notes taking while in school. But did not stick to any one method. Always looking for effective ways. You have some good tips here. Thanks for sharing.